Danforth offers the very best in Ice Surface Design-Build solutions. We have extensive experience in the installation and retrofitting of Ice Rink Systems. 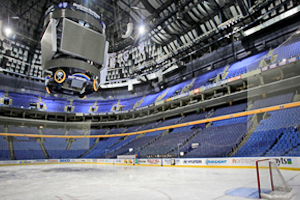 This experience has led us to be able to provide high quality rinks from recreational and community arenas to NHL-level arenas such as the Buffalo Sabres Rink at First Niagara Center. Quality Ice Rinks are the result of precise design engineering and proper construction and installation. Danforth’s Ice Surface Solutions Team strives to provide quality design and installation of Ice Rink Systems, which includes both the ice surface condition and the ambient air condition above the ice. We emphasize sustainable and energy efficient Ice Rink Design-Build solutions. Sound design and execution of installation is beneficial because it ensures user safety and decreases operating costs. We’ve partnered with Cimco Refrigeration to deliver holistic turn-key Ice Rink Design-Build solutions. This partnership brings together Danforth’s strong design expertise and industry-leading project implementation to better serve our customers’ needs. We believe in delivering quality solutions that live up to professional standards. Our completed works include Ice Rinks for Ice Hockey Arenas, Curling, Speed Skating and Recreational Facilities. Danforth’s unrivaled resources have allowed us to become industry leaders and set the gold standard for Ice Surface solutions. Start Your Ice Surface Project with Danforth. Meet with one of our Ice Surface Design-Build consultants. We’ll outline our process and begin your project estimate. Fill out an Online Estimate and we’ll reach out to you with an Ice Surface Design-Build proposal drafted to your exact specifications. Get answers about our Ice Surface Design-Build services and speak with a knowledgeable Ice Surface Design-Build Expert.